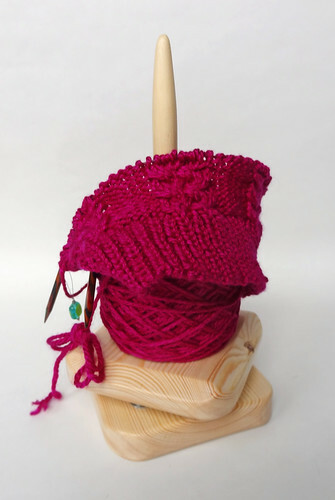 Looking at my January 2013 Crafting set on Flickr confirms my suspicions that I have been knitting lots this month. The trouble is, I've been knitting lots on lots of different projects, so I haven't got very far on most of them. I have got a finished Pterodactyl that I'm keeping for Friday's post, but it doesn't feel like I've got very far on the rest of them. I shall start with my Melia. Oh, how I LOVE this project and the yarn. Together they are a knitters dream. 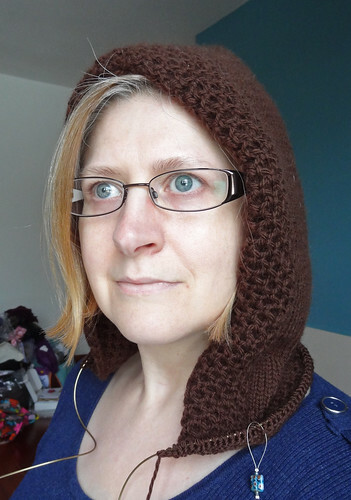 I have a finished hood. One of the many reasons I love this project is that it always has something to keep you occupied. 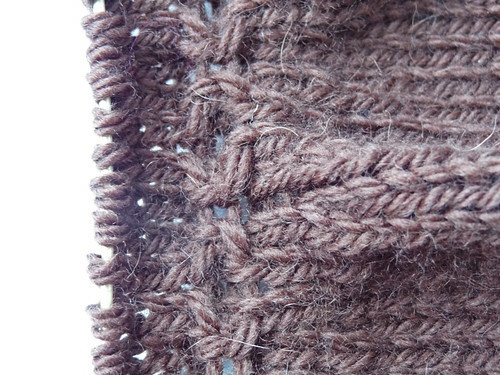 While you are churning out the hood, there are the lovely little cables at the edges to keep you happy. 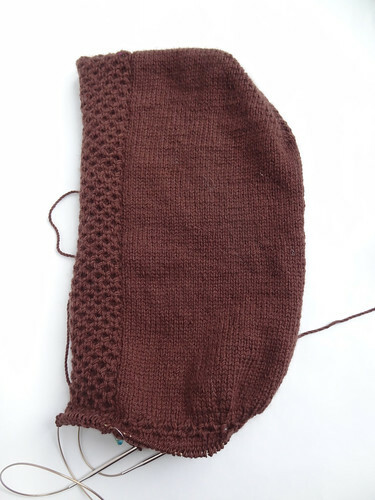 When you get to the neck shaping of the hood, you do one row of decreases and then you add four rows of the cable pattern, to pull it in the rest of the way. It's so clever! It makes an ordinary set of decreases into something pretty as well as functional. It also provides a strong section of fabric to prevent stretching across the shoulders in this seamless garment. As you can see, without blocking, the edge of the cabling pulls round. I think with blocking it won't pull round quite as much, but it will soften the edges nicely. The yoke hasn't been started yet, which is why the hood doesn't have much shape yet, as it isn't being anchored in the right place. 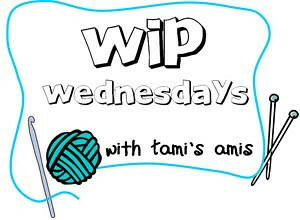 When I can tear myself away from this CTM project, am working on a test knit. It's a 'Giddy' Made With Love design. It's the first test knit I've done for Amanda, and I'm enjoying it. The test group is informal and relaxed and very friendly. I'm really glad I complimented the sample and said yes when I was invited to test it. I'm not going to show pictures or give details until the pattern is ready for release, as I haven't had permission. But I thought you should go and look at Amanda's other designs as there are some very pretty ones! Of course my other project is my Knotted Cap KAL! There are lots of very different yarns being used by the members of the KAL, and one person has even finished. Not only has Calophi made her hat, she even made some matching mitts, using the cable design from the hat. I love that she made the body of the hat a bit longer, which has changed the shape of the hat significantly. That wooden object, holding the skein, is a Yarn Pal. I've been looking for one in the UK for ages. I loved these from the US, but didn't want to pay the Import Tax. Then I was browsing Ripples Crafts for yarn and saw the Yarn Pal option on the shop headings. I was so pleased when I saw them I instantly put my name on the waiting list for one. It came last week and it's lovely. It keeps the skein off the floor when I yank it. In fact, I don't really need to yank it now as it just needs a gently pull to unravel the yarn. I'm just leaving this yarn on the Yarn Pal because the Fez, I'm using for Melia, came pre-wound and it doesn't really sit on the Yarn Pal easily. The yarn travels underneath and over the top of the skein in Fez, so I think I can only use the Yarn Pal in instances where I wind the skein myself. I used the Tubular Cast on from Woolly Wormhead's tutorial again. I do like how stretchy it makes the cast on edge. It also makes the edge look invisible as there is no hard line created as the cast on stitches stretch along the bottom. I've chosen to knit the cables without a cable needle. I did a photo-tutorial for employing this technique for my Handyman Hat pattern, but the principles are the same. 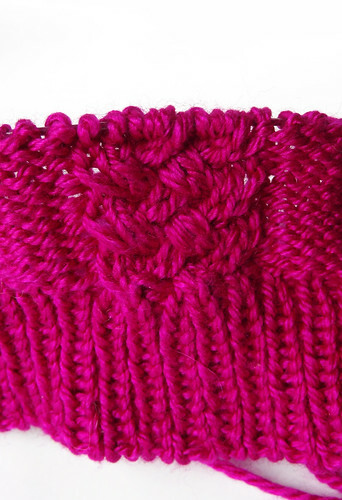 Cabling without a needle definitely speeds up the process of knitting this hat. I think this hat is going to turn out very nicely. I may even knit some mitts to match, if I have enough yarn left over! To see other works in progress, click on the button.